A new traffic pattern and new work zone was established on Saturday, 05/21/16, in Toll Lane numbers 3 & 4. Continue Toll Lane 3 & 4 reconstruction. Proposed Sign Structure Locations adjacent to the corner of Avenue B / E58th Street Corner, opposite the corner of Avenue C and 57th Street, and at the Garfield Avenue Structure (PSE&G Sub-Station) will be constructed. When needed, Bayonne PD or Jersey City PD will be asked to support this effort. Deep foundation (drilled shaft) work will begin in the ramp median work zone near the Toll Plaza. New retaining wall and roadway construction on Avenue E near 53rd Street will continue. Begin structural steel erection during the week of 06/13/16. The southbound Route 440 Jughandle at Pulaski Street has been reduced to a single lane and a median work zone has been established in Route 440. Deep bridge foundation work will continue at the Jughandle. Ramp roadway construction will continue. A new work zone was created on Pulaski Street. Drainage and utility work will begin in this new work zone. This work will be supported by Bayonne Police as needed. Tomorrow during the day, there will be a traffic shift onto the new Chosin Few Way (formerly known as Peninsula Road) near the port and industrial area around the Jersey City border. Drivers on the new Chosin Few Way, between Port Jersey Boulevard and Pulaski Street, will shift onto the new road alignment which will be a one-way road heading southbound onto Pulaski Street. Signs will also notify trucks and other drivers that the Northbound movement from Pulaski Street toward Port Jersey Boulevard will no longer be possible along the new Chosin Few Way due to the one-way configuration. A new traffic pattern and new work zone will be in place in the Toll Plaza beginning Saturday, 05/21/16. Begin Toll Lane 3 & 4 reconstruction. During the weekend of 05/20 – 05/22/16, Toll Lane 1 & 2 (right side entering the Turnpike) will open and Toll Lane 3 & 4 will be closed to accommodate staged construction. 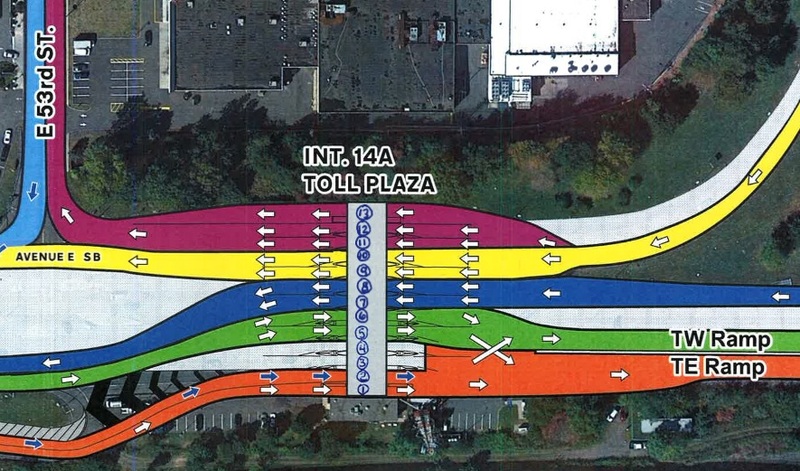 Toll Lane 3 & 4 are expected to be closed for 10 weeks. In support of the Toll Plaza work, northbound Avenue E will be temporarily reduced to a single lane through this weekend between 52nd Street and the Toll Plaza to implement the change. This work will be supported by Bayonne Police. Roadway construction work will continue on Pulaski Street and at the Jughandle. This work will be supported by Bayonne and Jersey City Police as needed. During the day on 05/23/15, traffic on Chosin Few Way, between Port Jersey Boulevard and Pulaski Street, will shift onto the new road alignment and be converted to one-way southbound (towards Pulaski Street). This change will coincide with Pulaski Street traffic being shifted north onto the newly reconstructed roadway and a new work zone created on the south side of the street. During the weekend of 05/20 – 05/22/16, Toll Lanes 1 & 2 (right side entering the Turnpike) will open and Toll Lanes 3 & 4 will be closed to accommodate staged construction. Toll Lanes 3 & 4 are expected to be closed for 10 weeks. Please refer to the graphic below. In support of the Toll Plaza work, northbound Avenue E will be temporarily reduced to a single lane through this weekend between 52nd Street and the Toll Plaza to implement the change. This work will be supported by Bayonne Police. During the weekend of 05/20 – 05/22/16, Toll Lanes 1 & 2 (right side entering the Turnpike) will open and Toll Lanes 3 & 4 will be closed to accommodate staged construction. Toll Lanes 3 & 4 are expected to be closed for 10 weeks. In support of the Toll Plaza work, northbound Avenue E will be temporarily reduced to a single lane through this weekend between 52nd Street and the Toll Plaza to implement the change. This work will be supported by Bayonne Police. New retaining wall construction on Avenue E near 53rd Street will continue. During the evening of 05/16/16, one of the two turn lanes on Pulaski Street at the Route 440 intersection will be closed for roadway construction. The lane will reopen on 05/17/16. During the week of 05/23/16, traffic on Chosin Few Way, between Port Jersey Boulevard and Pulaski Street, will shift onto the new road alignment and be converted to one-way southbound (towards Pulaski Street). This change will coincide with Pulaski Street traffic being shifted north onto the newly reconstructed roadway and a new work zone created on the south side of the street.